How To Use The Konad Stamping Nail Art Kit | Memorable Days : Beauty Blog - Korean Beauty, European, American Product Reviews. 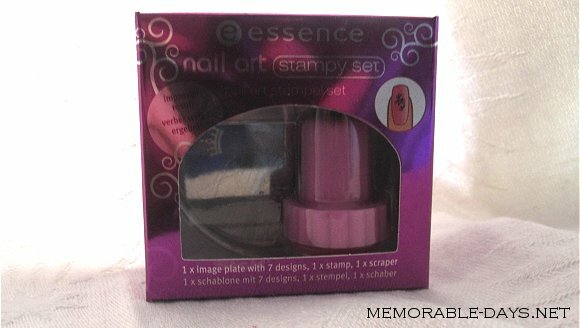 In this blogpost I'm going to use the Essence nail art stampy set. This stampy set comes with 1 stamping plate with 7 designs, 1 stamp and 1 scraper. The price for this set is €3.-. You can also buy a kit at the Born Pretty Store which comes with a plate as well for less than $3.88 and free shipping. However I'm not going to use the stamping plate which is in the Essence stampy set today. I'm going to use the Hello Kitty stamping plate which I got for free at Born Pretty Store. Have you girls receive it yet? What else do you need before you start? cotton pads, nail polish remover, large piece of paper and nail polishes. You have to put a piece of paper or a large sheet under your stamping plate cause it's going to get （　ﾟДﾟ） dirty! Btw. I recommend a thick nail polish with a good coverage, cause you won't see much with a sheer nail polish =/. Make sure that you removed the plastic cover on the stamping plate. Ok ready?! Step 1: Choose a design, I chose the Hello kitty design of the stamping plate m71. Step 2: Put some nail polish on the Hello Kitty design, cover it completely. I used the Dear'Lee black nail polish. Step 3: Use your scraper and scrape off the excess polish, leaving only the nail polish what's in the indentation of the design. Remember: you have to scrape it fast and you can only scrape it once. Don't scrape it again if it didn't work in the first place cause your scraper is dirty - just clean it with nail polish remover and start over again. Step 4: Use your stamp and press it on the design. You can stamp it straight down onto the design or you can use a rocking motion, pressing the stamp down starting from the right then rocking it to the left. Remember: the time between the scraping and the stamping should be very short, cause the nail polish will dry very quick. Step 5: Quick check if the whole design is on your stamp. Step 6: Quickly press the stamp on your nail following the curve of your nail. This has to be fast as well since the nail polish can dry on your stamp. I cleaned the plate, stamp and scraper after every use with some nail polish remover and cotton pads. It takes some practice to get the correct timing and placement on your nail. Besides, you have to work very quick on every step cause the nail polish will dry fast. You can also put two nail polishes on the design, see pictures below. This design is from the same stamping plate (M71) It doesn't look perfect yet xD I need to practice more lar..
@Sam, Ja, helaas zag ik ook al krasjes na een paar keer krassen =(. Maar door het zachtjes te doen en zodra je weet hoe je het moet krassen krijg je ze niet. Maar inderdaad met een bankpasje heeft dezelfde werking eigenlijk :) is misschien wel beter xD? thanks for the tutorial!!! i don't know how to use konads, lol. and this konad plate came in from the mail sometime ago but i don't have a stamper nor a scrapper =.= they don't sell these things in HK...boo! @Melody, yess, i'm sure that they will send it to ya since most of the people already received it ^^ hope it will arrive soon! @Michelle, ahhahaha are you serious? lol xD!! well i saw the nail stamping stuff earlier and found another way to do it :)it only requires your printer! @hihihi! great job ^^ it worked quite well on your nails ;). But I know that heaps of people are clumsy and can't put the nail polish neat on the printed picture ;). Awe cute i love hello kitty! stamping art rocks!Its so easy to use to so professional! it does not work....the design does not come at all on the stamping tool....how do i do it?? ?